How Special is Babar Azam? With over 1,000 ODI runs, 5 ODI centuries in 25 innings, an average of 56.78, and a strike rate of 90.50 - at the age of 22 - I think extremely special. 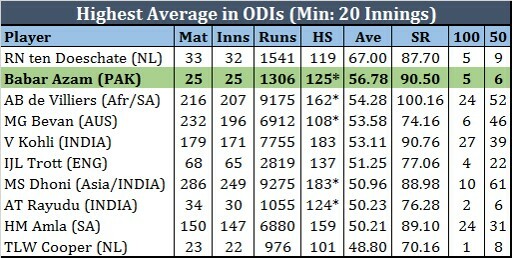 That average of 56.78 is the second best average ever in ODI cricket; and if you exclude associate nations, then Babar Azam currently has the best ever ODI average of all time. Among these 10 batsmen with the best ODI averages of all time, Babar has the third best strike rate, behind the magnificent AB de Villiers and very marginally behind the great Virat Kohli. For Babar to be spoken of in the same breath as ABD and Kohli, he will have to sustain this performance and average for at least another 100 ODIs. With the start he has achieved, I do not have any doubts that in about 5 years time, Babar's ODI record will be very similar to that of ABD, Kohli, and Amla. Out of his 25 ODI innings, Babar has played nine at number three and all of his 5 ODI centuries have come from that position. Why Pakistan even bothers to change his batting order around is beyond me. He has been phenomenal at number 3. His average of 95.62 at number 3 is the current best ODI average ever from that position. 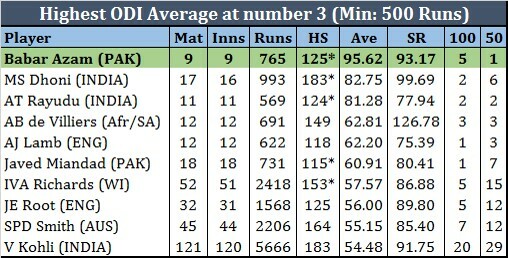 Among the 10 batsmen with the best ODI averages at number 3, only ABD and MS Dhoni have a better strike rate than Babar Azam's. 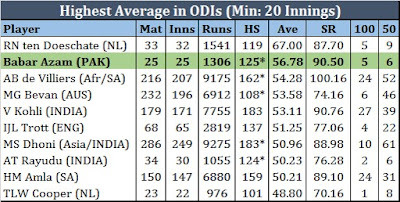 I'll say it again that in order to be considered one of the best alongside Virat Kohli, Steve Smith, Joe Root and other star performers at number 3 in ODIs, Babar will have to sustain this performance for another 30-40 odd ODIs. Pakistan's team management will have to play its part though, by sustaining with him at number 3. 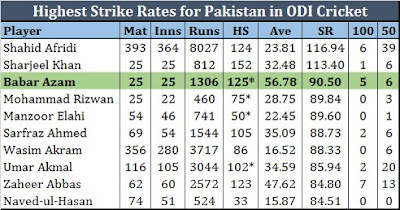 There are only two batsmen in all of Pakistan who have a better strike rate than Babar Azam in ODIs - the one and only, Shahid Afridi, and the one who may never play again, Sharjeel Khan. Never has Pakistan had a batsman like Babar, who scores freely and consistently. Not since Zaheer Abbas, Saeed Anwar, and a young Inzamam Ul Haq anyway. 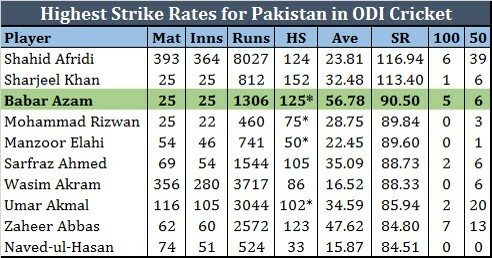 But even those names (besides Zaheer Abbas) do not feature in the top 10 batting strike rates for Pakistan. This is just the start of what looks like a promising career. Earlier this year, Babar joined the likes of Sir Viv Richards, KP, Trott, and de Kock as the fastest batsmen to reach 1,000 runs in ODIs. It took them just 21 innings. No one has for their faster. Here's hoping that Babar Azam continues in the same vein and that he continues to build on this exceptional platform by scoring runs and runs and more runs. For this batsman is special and Pakistan have rarely seen better.